We usually plan on a trip to Eagle's Bluff this time of year, but it's looking like water won't be readily available on the trail. As a precaution, we're going to make the Chickamauga trail our fall tradition. Overall, it exhibits similar qualities including breathtaking views of fall foliage. Q1. Does this new section have breathtaking views of fall colors? Yes. Yes it does. Q2. Does this new section have big elevation changes that will challenge my fitness level? Yes. It is literally uphill both ways. Q3. Does this new section have a private waterfall at our campsite? Yes. Yes it does. 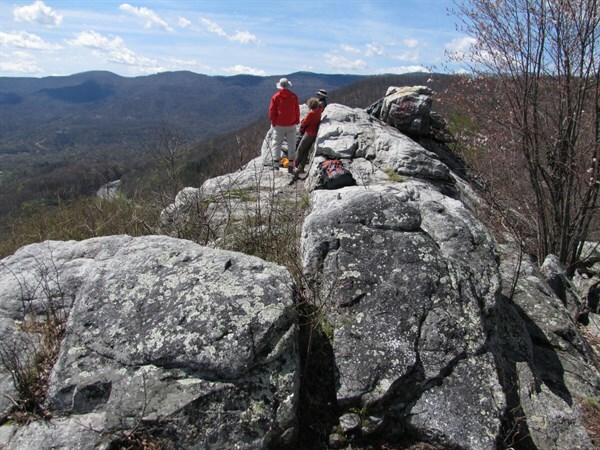 Difficulty: This is considered a strenuous trail with some serious elevation changes. Proper footwear should be worn and hiking poles are recommended. Hikers in good physical condition with previous backpacking experience hiking are welcome. There is significant elevation gain and loss on this trail. Children Policy: This trip is limited to participants 18 years and up who can handle the mileage and terrain. Dog Policy: Friendly dogs on leashes with prior hiking experience are welcome. Weather Policy: This trip is drizzle or shine. In the event of severe weather, this trip may be postponed or cancelled. Cancellation Policy: If you register and need to cancel, please email Teamlightning@lightning100.com. Registration is required for this event. If you have any questions please email teamlightning@lightning100.com.